It started in Indiana, where he was born in 1985, brought up right, a good person, at 6'5" and 250 pounds he was good enough to be considered as a right-handed pitching prospect. He entered professional baseball as a top minor league prospect in the Red Sox organization in 2006, first appearing at Fenway for the 2008 season in 36 games, posting a 6-5 record and 3.16 ERA. It started out of the bullpen, but quickly transitioned into a starting roll where he impressed pitching coach John Farrell. Suddenly out of no where in 2009 he was traded to the Indians where he became a starter while pitching 180 innings in 2010, 216 innings in 2011 and 206.1 innings in 2012. It topped out in 2013 when he became the ace going 193 innings, posting a 14-10 record with a 3.45 ERA. Then he entered his free agent season, at the top of his game and a good season would have translated into a large payday. The key words are 'would have', as the 2014 season spiraled down into injuries. First he tore his right oblique, endured an impingement in his shoulder and finally after being trade to the Cardinals in the middle of their post season run his knee acted up and he was shut down for the season. Not the ideal way to kick off the free agency bidding war that one hopes for. He never complained, as there were plenty of team that showed interest in his services with the Red Sox finally coming out on top. 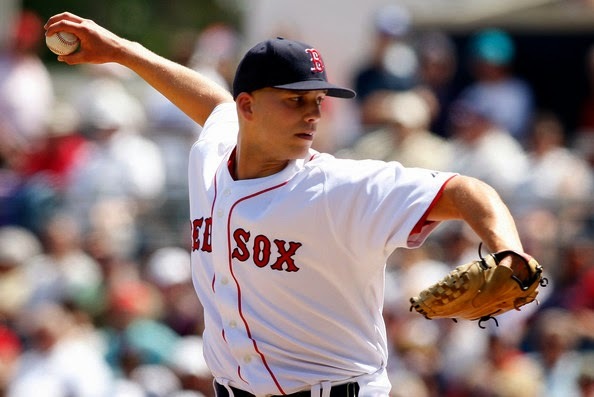 We are talking about Justin Masterson of course, whom the Red Sox brought back for a single 2015 season for $9.5 million in salary and a possible $2.5 million in bonuses if he reaches 185, 190, 195, 200, and 205 innings. The plan of course is to put together a good season, a bounce back season that puts him back into free agency in 2016 for a multi-year deal with a salary he missed out on this year. "I hear people say that to me all the time. Have a good year and you'll get the big contract, but if I was overly concerned about that yeah, that would be the case," Masterson (7-9, 5.88 ERA last season) said Tuesday in an interview with Nick Cafardo of The Boston Globe after a workout at the Sox spring training complex at JetBlue Park. "It's just more fun when you pitch better and when you're able to help your team win. That's what I want to get back to." He is slotted in as the Red Sox fifth starter, but if he is healthy he should be much better than that. All of the injuries healed without surgery. His oblique has healed and the scar tissue has broken up and he now has full range of motion. The impingement and the inflammation in his shoulder is also gone. The knee didn’t have lasting damage. "It was not fun whatsoever," he said of his ordeal. "Some of it was my hard-headedness and pig-headedness and not taking care of the things that were going on. You always have something. You’re never 100 percent, so you think you can fight through it and I thought I could. I didn’t do enough after I tore my oblique to get it 100 percent. It turned out to be more than it really was." After being shut down the doctors prescribed rest and rehabilitation. He spent the winter with his personal physical therapist, Noah Campbell in Indiana and he was supervised by the Red Sox. One of the reasons he chose Boston is that his former Indians trainer, Rick Jameyson, is now the Red Sox head trainer. "For a guy coming off injuries like I had, the medical staff and training staff was important to me," Masterson said. "And I know they had a good one here and people who knew me." He felt he was reaching a peak in his career before he got hurt and believes he can pick up where he left off. It was a close call that he even came back to Boston, as he came close to going to a couple of other teams. He said there was frantic ending to the decision. "It was close," he said. "I love the Red Sox. The other two teams had good things going on with them, too. So it came down to what's the separator? If it's only a year, where do you want to be? Could this turn into something bigger? We were flipping some coins at the end. I didn't know what to do. We were in Cleveland for so long, so in the end we said, we know Boston. We know John Farrell. We know the medical staff. I'm happy with my decision. I feel this is where I belong." It has been six years since the Red Sox traded Masterson and they bring him back with wounds and all, hoping for a starter that rises above the fifth slot in the rotation. Look out Clay Buchholz, you have to pick up your game in 2015 as Masterson is back and looking pretty solid.